Mea Culpa Notice: I was in error. 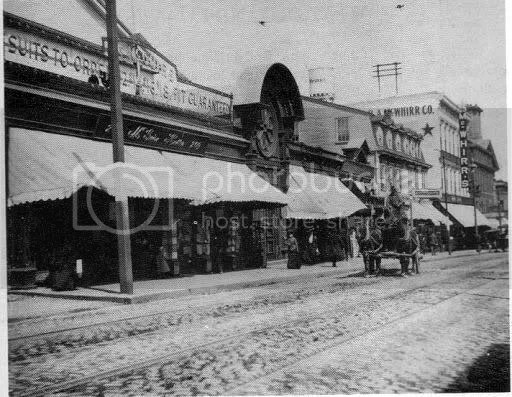 McWhirr’s Dept Store, as shown here was not inside the Cherry & Webb Building. It was a separate structure subsequently torn down and another building in its place. 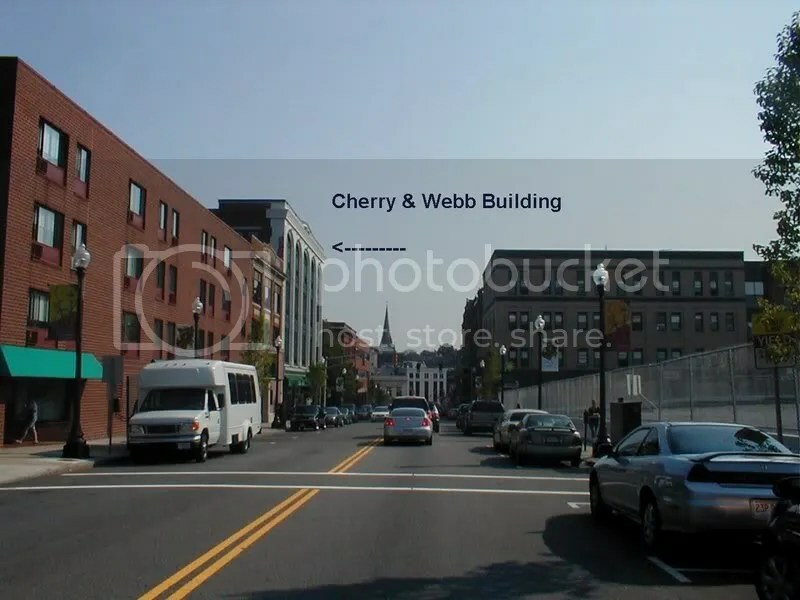 The Cherry & Webb building, however still stands as indicated below. In Lizzie’s day this was McWhirr’s Department Store, an upscale department store where anybody who was anybody shopped. Shown in this photograph, the name “McWhirr” can be made out on the top of the white building in the background. The Cherry and Webb Building (so stated on the front of the building) is located at 139 South Main and is now the UMASS-Dartmouth Professional and Continuing Education Center a learning center for professionals, night students and other students. On the ground floor is the Café Arpeggio. Bristol Community College has recently leased space for special courses for special needs. 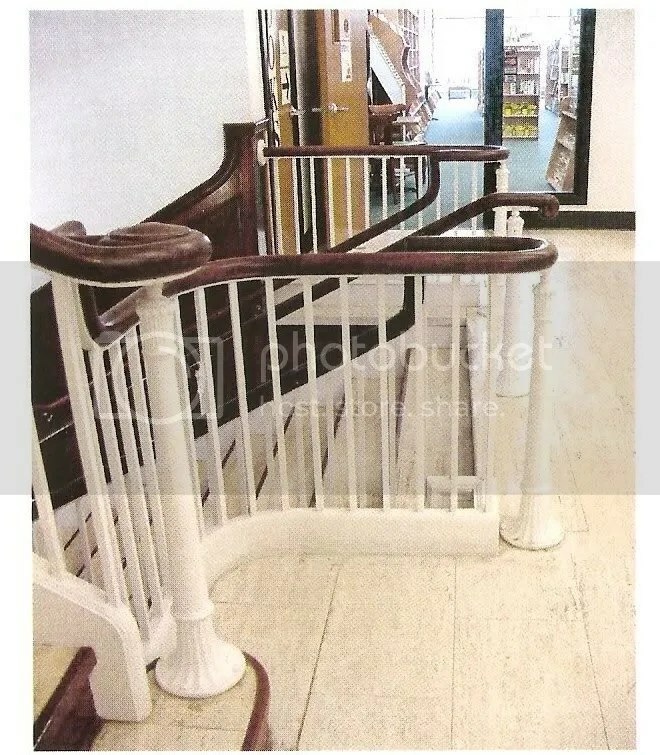 Baker Books, once there on the ground floor in April 2007, gone by August 2007. Darnit. Previously “one of the city’s most underutilized downtown structures”, Mayor Lambert is credited with its current public use.When I spoke to security, building maintenance technicians, administrators and students, one of the things I learned is that this facility is being used to assist with GED education for a number of the nearly 900 employees who lost their jobs by the closing of Quaker Fabric. 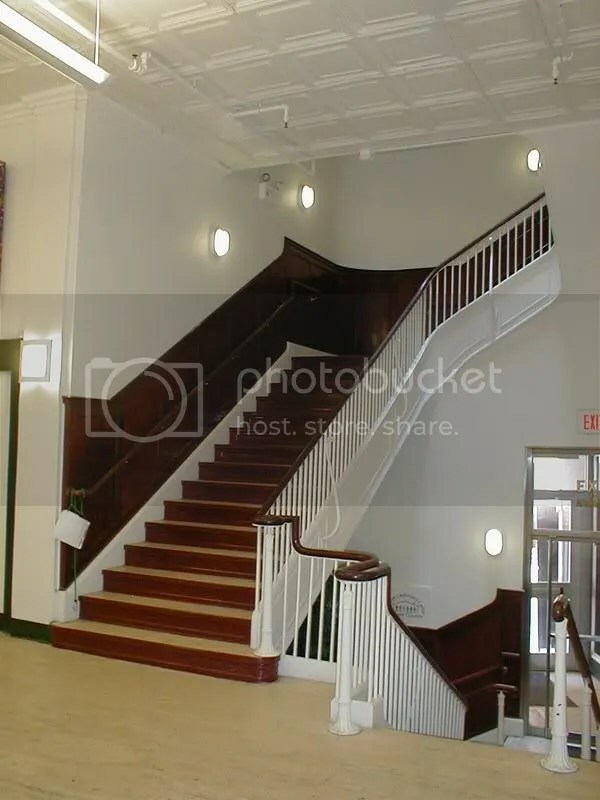 I also learned that the only interior “original” to this building is the grand staircase shown below. 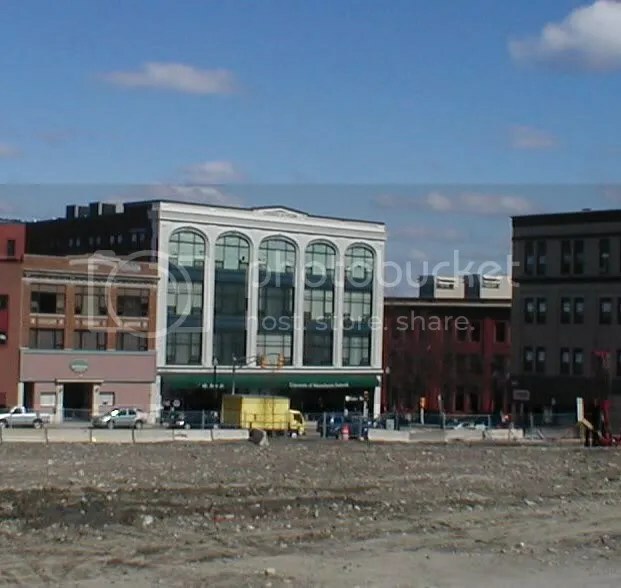 There was a time when the building was known to all Fall Riverites as “McWhirr’s”. Imagine Lizzie in her blue India silk bengaline inside this store moving about amongst the crowd. Imagine Lizzie taking a five fingered discount of oh, say, a pansy broach and sliding it up inside her so conveniently fitted gloved hand. 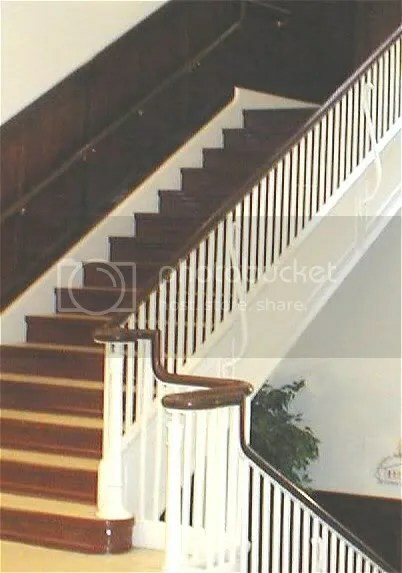 Then, with a casual grace and the deportment of “a Borden” strolling towards this staircase and ascending to the second floor. Without batting an eye nor turning her head to see if she’s being followed, she would maintain a steady but lady-like gait as she faked interest in nearby displays of hats, porcelain figurines, and petite carved bottles of French perfume. With a skill only acquired from experience, she would be diligently aware of any store employee watching her from a near distance. Her heart beating to the exhiliarating thrill of this familiar challenge and satisfied no one was following, she would turn back to the stairway and begin her descent, one lady-like step at a time. Below her she would survey the vast array of glass table top and standing shelved display cases, filled with products from near and abroad. Men, women and children busy shopping, strolling and admiring all the goods. Busy store clerks packaging purchases and preparing sales slips. Busy, busy, busy. She would survey it all, calmly determined in her objective. One gloved hand on the railing, the other modestly angled upright, her fashionable cloth purse looped over it. Posture perfect, a lady of some stature, she would have looked straight ahead, a seemingly blank stare masking a steeled will. She would descend, slowly, each step measured with her resolve and comforted in the fact her broach not the least bit detected as it nestled securely inside her modestly priced but exquisitely stitched leather glove. Pausing at the bottom step, brazenly she would hold up that gloved hand with its secret deposit and there she would act as if only adjusting the fitting. Only a moment, but pause enough to quickly ascertain once more with a quick scan if any authoritative and watchful eyes were upon her. They are not. Only a fresh-face counter girl who looks directly at her and says: “Good morning, Miss Borden”. She would respond with a tilt of the head, a forced, kindly smile, and she would begin her walk towards the front door. A slight turn to the left and she would be on her path, curving here, curving there passing the cases, dodging a small child, brushing skirts against other ladies. Closer, each step closer. The front door now in sight. Only 32 paces,…. now 20, and the heartbeat accelerates,….. now 12, and the breathing more pronounced…..now 9, and a slightly fevered brow…..now 7 and a quivering chin….the uniformed doorman sees her approach… now 2 steps, two steps only as the doorman pulls upon the door and tips his hat…the step across the threshold…, now daylight. No arm upon hers. No hand upon her shoulder. Big exhale. The quivering chin ceases to quiver, the pulse rate subsides, the fevered brow cools in the bright sun. A liberating wave of relief engulfs her. She feels…. a profound sense of…..special achievement by way of genetic entitlement. Actually, considering the fashions of the day, forget the broach. She could have concealed a Virginia ham under those skirts. And many of the “ladies who went a-thieving”, in fact, did just that. But not at McWhirr’s. Next door to “Maplecroft” this house was once owned by Lizzie Borden. This Victorian is and always has been a three family home but was once known as the James Davenport House and was built in 1879 by the ninth mayor of Fall River. Painted last summer with lovely new landscaping and planters added – among other improvements – it was listed for $315,000 last August but sold just before Christmas last year for $282,000. I wrote about this last October but had wrong information. Michael Brimbau, the owner since 1992 (and author of The Girl With The Pansy Pin) moved out to work on the charming fixer-upper he purchased on Charlotte White Road in Westport. Stefani Koorey remained until it was sold. One of those very old homes built with one bathroom on first floor but second bedroom on the second floor. Improvements have been made. Mr. Brimbau has also written a clever comedy By the Naked Pear Tree: The Trial of Lizzie Borden, actually a play in which two of the scenes had been performed at the Somerset Library by the Pleasure of Poetry Club . And yes, that’s Stefani Koorey in the front. The one with the moustache. Judging by the photos on the link above, looks like this group had a lot of fun. By the way, I highly recommend Mr. Brimbau’s book. It is quite funny and very well written. UPDATE: “MAPLECROFT” FOR SALE AGAIN. Created by author Rebecca Pittman – The History & Haunting of Lizzie Borden. Enjoy. BTW, while I think Kristee Bates has done a very good job in renovating “Maplecroft”, I still do not think this is how Lizzie had it furnished and decorated in her day. Lizzie selected only the very best of furnishings, fixtures and equipment because she could well afford it. Her home, which she nurtured and lovingly maintained as if it were her child, had the very best appointments. She bought only “the very best”. Kristee worked on a budget and it does not escape the discerning eye. Nonetheless, it is still beautiful and representative of Victorian homes of the 1890’s. However, one only has to go to the Fall River Historical Society or the Easton Tea Room (1870 Alexander Dorrance Easton residence also owned by the FRHS) to see the high quality wallpaper and exceptional quality furniture donated over the years. The difference is remarkable and unmistakable. There one will find furniture and fixtures inside these two establishments closer to what “Miss Lizbeth” would have had in her own home. While the precise decade (1893 to 1927) Maplecroft’s renovated interior is reflecting is unclear, the Lizzie Borden Bed & Breakfast Museum is furnished exactly as it would have been on August 4, 1892. Aspiring and inspired detectives can play out what they know or suspect of the crimes with a full and thoroughly captivating “stage”. Kudos to the original “set decorators” and Kudos to General Manager Lee-ann Wilber (since 2004) and owner, Donald Woods, who have not altered its base authenticity. And a special Kudo to Rebecca Pittman for providing us with the first ever video showing the interiors of both the Second Street and French Street homes in which Lizzie lived the entire first half and entire second half of her life, respectively. Well done! Well, it’s been nearly 8 years but the scam has surfaced again – this time on eBay. I replied and we communicated further – and I did a little investigation on this which supported my immediate skepticism. Read all about here in this blog posting I did at the time. I hope this finds you well! “Lizzie Borden Took an Axe” wrapped up a 3rd consecutive sold-out run at the Barnes-Hiscock Mansion in Syracuse this October! Some of the cast members and I even squeaked in a trip to the Fall River bed & breakfast! During the run of the show we decided to create a short skit: “A Borden Family Christmas.” There are plenty of gems in it to keep the most orthodox Bordenophile laughing. We had such a blast making it. This video is very funny and very “inside”. I love it! Some years ago I did my own parody – cllck below. Scroll down to “It’s a Wonderful Life“ – when Deadwood was still on HBO. If you ever have a chance to see Garrett’s play, BUY TICKETS IMMEDIATELY!! Been reading Rebecca Pittman’new book which is unlike any other Lizzie book written to date. This 826 page marvel shows deep research, surprisingly probable speculations, and is an overwhelmingly thrilling read. There is a generous number of images – many never seen before in this stunning work. In the “A New Address” chapter readers will find exclusive post-renovation interior images of “Maplecroft“, the home Lizzie lived in the entire second half of her life. In the “Interviews” section we find a “coming together” (inside joke) of the three major Borden Blogmasters,, i.e., Shelley Dziedzic, Stefani Koorey, and moi revealing our embryonic interest in the case, etc. I’ll be doing an in depth review when I finish reading this book and after I return from an overseas vacation. Meanwhile, don’t wait. Buy it! Available at Amazon. NEW FALL RIVER HISTORICAL SOCIETY WEBSITE IS A STUNNER! The Fall River Historical Society has just premiered their long awaited re-constructed website and it’s a stunner! Of course the menu tab has “Lizzie Borden” but contained therein will be found thrilling to Borden case researchers. The curating and organization are exemplary. Outstanding all around. Here’s a photo sampling from the various “Collections”. I’m not going to explain what they are or who they are because if you are reading this you need to go to the site and emerge yourself. Here’s the LINK.